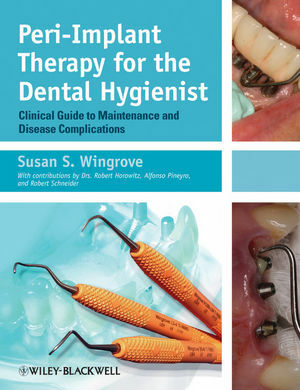 Peri-Implant Therapy for the Dental Hygienist is a comprehensive guide for implant history, prosthetic designs, and patient selection including oral systemic health and risk assessment. The text also discusses pre-surgical procedures, communicating with patients about implant dentistry, in-office maintenance protocols, plus new innovative home-care options to ensure success of the implant and overall health of the patient. An essential tool for dental hygienists to prepare to take on this very important challenge in the profession, Peri-Implant Therapy for the Dental Hygienist is a valuable resource for the entire dental team. A.I.M. for implant success; guidelines to Assess, Identify, and Monitor dental implants. Safe, effective instrumentation protocols for dental implants and all the various prosthetic designs.